From a video of April 7, at least 12 men executed, rebels with free access allege, by "Alawites"
The Deir Baalba Masscare of mid-April, 2012, is not the only but perhaps the largest one to hit that large and hard-fought district of Homs. The timeline of this violence is exceptionally confused. It seemingly began on April 2, but only took off with mass executions from the 7th on, and stopping sometime prior to the 12th (this whole span will be considered here). With details not entirely clear, it seems at least 200 civilians (primarily adult men, but many children and women as well) were executed over a few days, apparently in several sub-massacres. 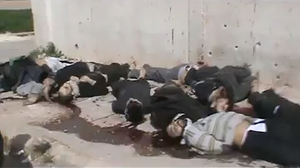 Considered together as one extended killing spree, however, it places high in size among the Homs Massacres. Neither side in the conflict seems to have told their full side version of this incident, though both have weighed in. Syrian state TV SANA lodged the first report of a massacre on the 2nd or 3rd, while rebels only scooped up a few "shelling victims." Opposition sources blame the regime or "Alawites" for shelling and executions all through the ten-day span. But they only obtained proof of the worst of it afterwards, reporting mass graves found on the 10th and after. (see LCC narrative). The VDC's and others' lists show certain families were singled out for several deaths each, including a startling 58 members of an extended Al-Abbas family/name, spread over several decimated sub-families. Other names like Kanaan, Al-Sheikh, Nasser, Haijan, Rajab, Al-Ali, Suleiman, etc. keep re-appearing in groups and in different combinations. The alleged sole survivor of a singular mass killing of probably 200 or more on April 2, as he tells it, blames "Shabiha and supporters of the regime" and/or "Iranians." First they raped the women and slaughtered the children, including his own, then gunned down about 180 men, he says. But the story told by "Abo Haitham" is logically problematic, suspiciously dramatic, heavy on pleading for foreign intervention, vague in spots (like victim family names), and conflicts with the drift of all other reports, which often conflict with each other or themselves anyway. April 8: Found in a Barn: 16, 14 named, reportedly found April 12. April 7/8? "Found days after": Total = at least 44 from a mass grave found on the 10th. April 9? : April 11 Finds: Another mass grave on the 11th. Total = 65-66, after excluding a few already listed for the 7th. Later Finds: In 4 sub-groups, from April 13 to May 1, at least 53 more victims emerge. This page was last edited on 9 February 2014, at 12:03.